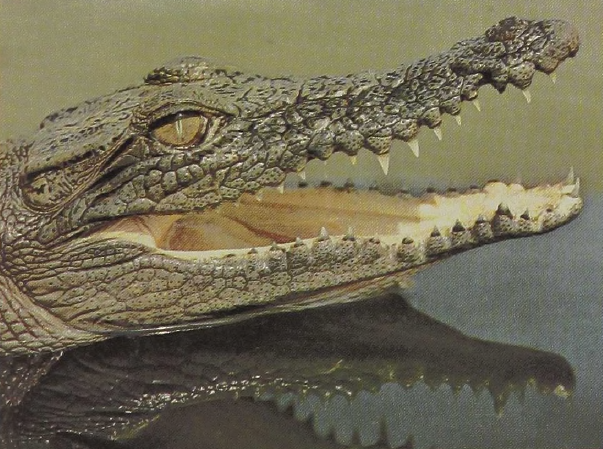 This is the largest of crocodilians. These estuarine animals have been documented at lengths over 20 feet with weights well over a ton. While the species ranges from Sri Lanka (Ceylon) to Australia, the largest specimens appear to have been taken in the Philippines, mostly at the end of the last and the beginning of the present century. 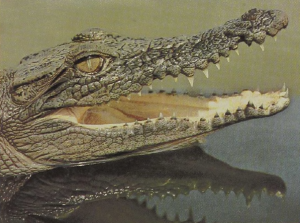 Many crocodiles enter the coastal zones of the oceans, but the Estuarine Crocodile regularly swims far out to sea, and its distribution suggests that specimens have traveled more than a hundred miles of open ocean. While the species subsists mainly on fish, it will attack other large animals, and in former times there were many records of attacks on man.